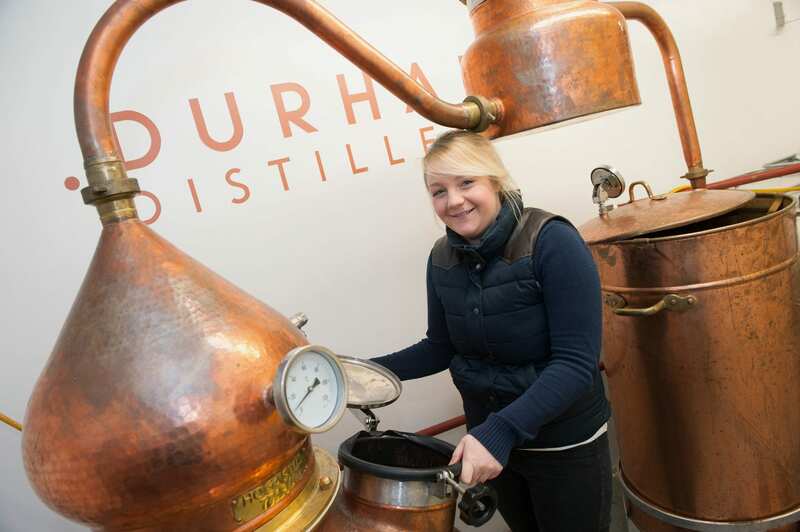 You could be forgiven for thinking your gin has given you double vision when you meet the distillers from Durham Distillery. On the one hand there’s Jess Tomlinson, Head Distiller from North-East England’s first distillery, with her classic London Dry gin bursting with the savoury hint of celery combined with spicy notes of pink pepper. On the other, there’s Lee and Melissa Katrincic, the founders of Durham Distillery in North Carolina with their award-winning Conniption American Dry gin with its hedgerow taste of honeysuckle. 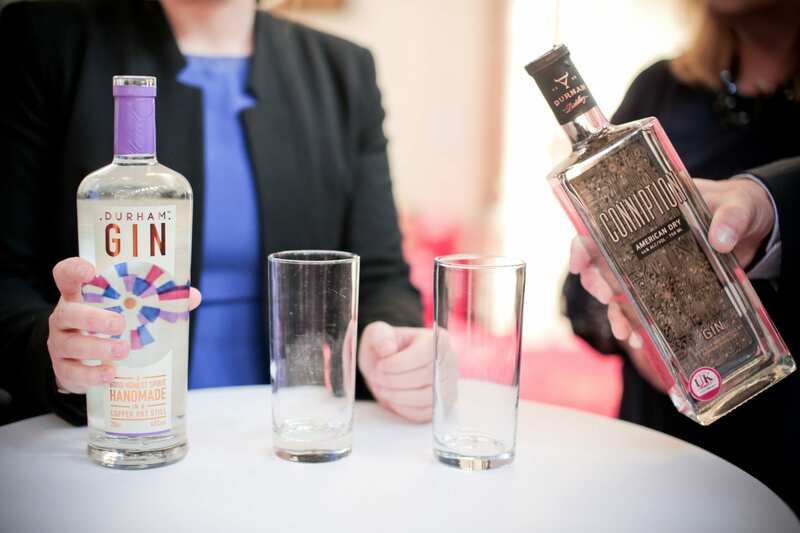 The distillers from the two Durham distilleries on opposite sides of the Atlantic met for the first time at The Gin Guild’s Spring Installation at The Guildhall, London, and found they have much more in common than just making great gin. 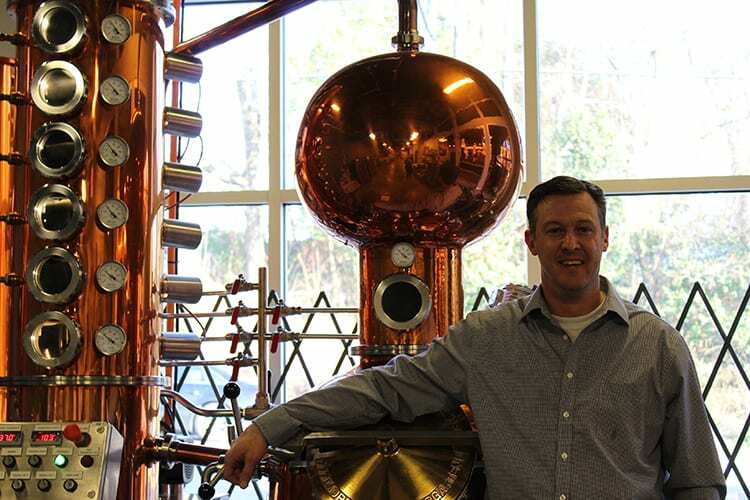 Both set up their distilleries at the same time, although the Durham UK gin reached the market sooner due to the more restrictive licensing laws of North Carolina. They share some classic botanicals: Bay Leaves, Caraway and Rosemary – all used in the Conniption Navy Strength gin. And both have invested heavily in their branding, with the magnificent rose window of Durham Cathedral inspiring the roundel viewed through the Durham gin bottle. The USA Conniption gins – named after the American South’s word for a tantrum – are inspired by the concept of a fit of inspiration and, again, the explosive design is viewed through the contents of the bottle. Jess Tomlinson describes the salty savoury notes of the Durham London Dry as ideal in a Red Snapper cocktail – gin’s answer to a Bloody Mary. Melissa Katrincic says the sweeter Conniption American Dry is perfect in a French 75 with sugar and lemon juice topped with Champagne or Cava. While the inspiration for the UK’s Durham Gin was the new wave of small batch craft distillers on the US East Coast, Lee Katrincic was a pharmaceutical chemist who chose to marry the techniques of vapour and vacuum, combining the science of distillation with the art of preserving and combining flavours. Both distilleries are seeking to change the drinking habits of their local populations. Durham USA is a city of some 300,000 people in a whisky-drinking heartland. While northeast England is an ale-drinkers’ paradise, the enthusiasm for craft gins is growing and being nurtured. Lee Katrincic explained: “Fresh and floral Hendricks got me into gin. Using our Rotary evaporator, we vacuum distil cucumber and honeysuckle flowers and blend that into our gin base off the pot still. “I designed this gin to be a contemporary gin and not be juniper forward. When we started, gin was not as popular in the American South, so this gin is a way to convince those who say ‘I don’t drink gin’ to try it out. 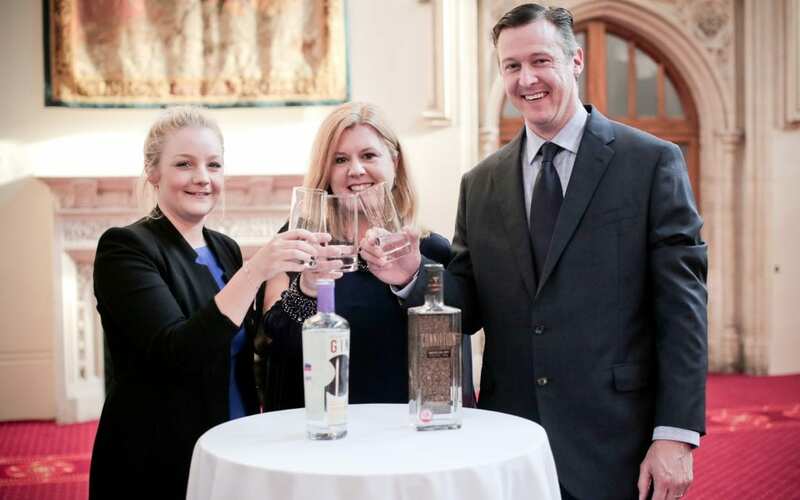 With Lee and Melissa taking their oaths as members of The Gin Guild, the Guild’s membership has grown to nearly 300 members, drawn from over 20 different countries across five continents. Gin Guild members include senior representatives of the major distillers, as well as those from medium-sized and craft distillers, journalists, sales and marketing and brand advisors, promoters, bar owners and cocktail experts, spirits packaging consultants and professional advisers.